You’ve been challenged to a duel, and the showdown is set to take place at High Noon. Click here to play! Will you show up and walk away the victor? There is plenty on offer if you succeed! 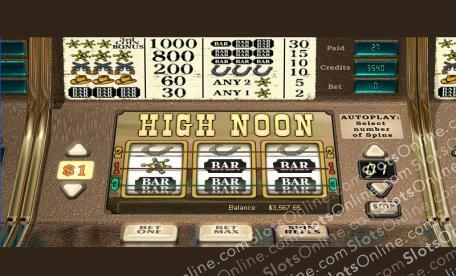 High Noon is a thrilling classic slot played across 3 reels and 3 pay lines, where the more lines opened allows for more winning combinations to be made. There are no pesky Wilds, Scatters, or Bonuses to lead you astray while you win, so just concentrate on spinning up the best combinations possible each and every time. The Horseshoes, Bars, Hats, and Guns will all help you win some wonderful payouts, but if you are more keen on the ultimate jackpot, then try spinning up the three Sheriff’s Badges on an active pay line in order to win up to 1000 times your initial stake. High Noon is fast approaching; will you succeed?